There are some reasons, why SUV cars are so popular. We don’t want to argue why, cos everybody knows own truth. It doesn’t matter if they’re bigger than ordinary vehicles; they’re good basics for tuning too. Especially these days they are very popular among tuning companies. Many tuned Porsche Cayennes of Touaregs are driving on our roads. And I think it’s just the beginning. Let’s say the truth – the big vehicle with perfect design and great quality is attractive almost for everyone. And they’re so attractive, that tuning companies produce new tuning packs for the cars that have been modified yet. One of these companies is a German tuner of Audi, VW and Porsche called Hofele Design that tunes the monstrous Audi Q7 again. So today, we have their second styling pack named „Full Option“. Audi Q7 isn’t a newbie on the scene, but its fame isn’t fading. But it’s vice-versa; thanks to its big dimensions with an aggressive nose, extra powerful engines and luxurious A6 interior; this mammoth is one of the most popular SUVs on the roads. And we can continue – luxurious comfort, high level of safety, attractive design and here we have a real family lover&#61514;. And what about its performance? Audi offers five engines for this model and the most powerful aggregate is a 4.2 liter V8 petrol engine including FSI technology and producing 350hp (257kW) and 440Nm of torque. Prepare yourself for amazing experience on the road and also fill your wallet, because its urban fuel consumption is 19.5 liters/100km and that’s not something expandable. Tuning accessories are much better than before and this is also the case of their design made by tireless designers and developers. 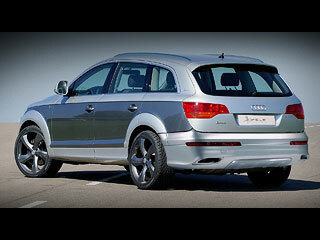 And the new tuning pack for Audi Q7 by Hofele Design is a real delicacy. The „Full Option“ styling kit consists of many exterior parts. So let’s begin with the front part and its new front bumper. It’s characteristic with two big, interestingly shaped openings that are bigger than the stock. They’re filled with a grey perforated sheet with big „eyes“. There’s an interesting addition to the bumper in form of two side spoilers with openings and stylish engine cover between them. In addition, the small side openings include four additional Hella lights – two fog lamps and two corner lights. The kit involves very exclusive front mask. It’s same as the one from A8, S8 or W12 respectively, enhanced with a chromed hem and chromed grill filling the opening of the mask. The last stop in the front part is a scope on the hood that isn’t very distinctive, but it has own importance. This change of the Q7 moves this SUV to next level. The side part of the vehicle has new decent side sills with integrated opening at their back. In combination with additional hems of fenders, chromed moldings of body and chromed hems around the windows are very nice additions of the modification. The rear bumper is totally new and it’s very different. It’s not only lowered, but it includes a protection of the chassis and integrated exotic exhaust tips on its sides. There’s a new rear wing on the rear doors enhancing the car’s sporting image. The tuners have also focused on the car’s suspension. Now the Q7 has sporting springs that decrease its height for 40mm. Extending washers are combined with beautiful 22“ 5-spoke Reverso-22 Anthracite rims with dimensions of 10Jx22“. These rims wear Pirelli 295/30 R22 slick tires. Design of the wheels is breath-taking and it matches perfectly to the car’s image. Hofele hasn’t show the interior yet, but I think that we can expect a new one full of carbon, leather and exotic wood. So the last part of today’s presentation – maybe it’s not good news, but performance tuning is available only for the „weakest“ diesel aggregate. For now. It’s a 3.0 turbo diesel engine producing 233hp and 500Nm of torque. But now it can offer nice 280hp and 580Nm. 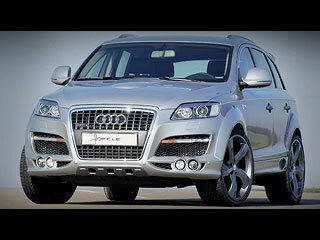 What is your opinion on Hofele Audi Q7 ?